I think I am a servant by nature. I don’t lead. I don’t teach. Tell me a need and I’ll do my best to meet it. I think it is that need to serve others that has been behind the desire to be a nurse. When I was little I’d say it was because I wanted to “help others.” Now? It is really just the same. I’ve been accused of begin idealistic and a little too romantic at times. “Things will just work out” and “everything will be okay” are things I say a lot. I have a feeling that balancing these traits with reality will be a struggle for me. I just look at it as another way I’ll become stronger. And it will likely keep me from giving up. So this summer has been one of checking things off the “Nursing School Check List.” I’ve been very diligent about getting these things done… EARLY. Lately I’ve been looking for a scripture to have engraved on my stethoscope. I’ve been through quite a few but I think I have finally settled on one. 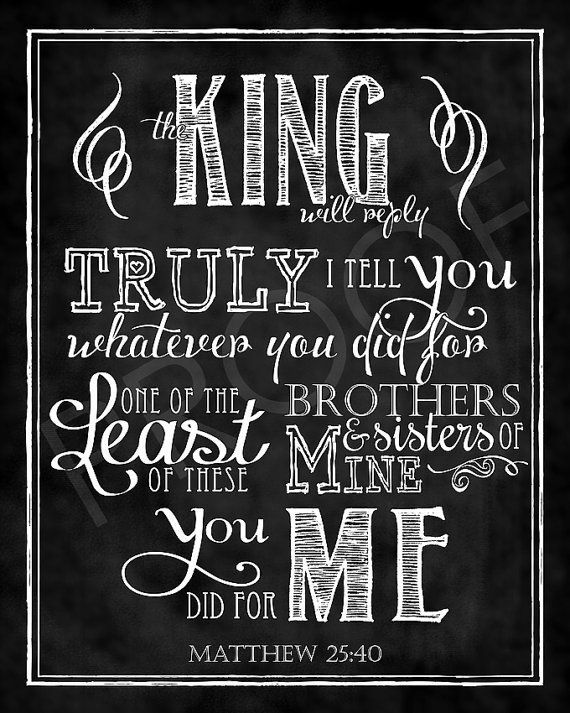 Matthew 25:40 says, “The King will reply, ‘Truly I tell you, whatever you did for one of the least of these brothers and sisters of mine, you did for me.” It reminds me of WHY I am doing this… WHO I am doing this for… and HOW I am doing it. Some patients will be easy. And some will be difficult. But I know that God is so good. He has gotten me this far. We’ll finish it together.